Clutter is a nightmare. If you are anything like me, you have your fair share of it around the house. It ends up everywhere. Bedroom? A mess. Closet? The stuff of night terrors. Bathroom? Don’t even get me started. What if it didn’t have to be this way? What if you could have your bathroom cake and it eat it too? Without having to burn down the house and start all over again. 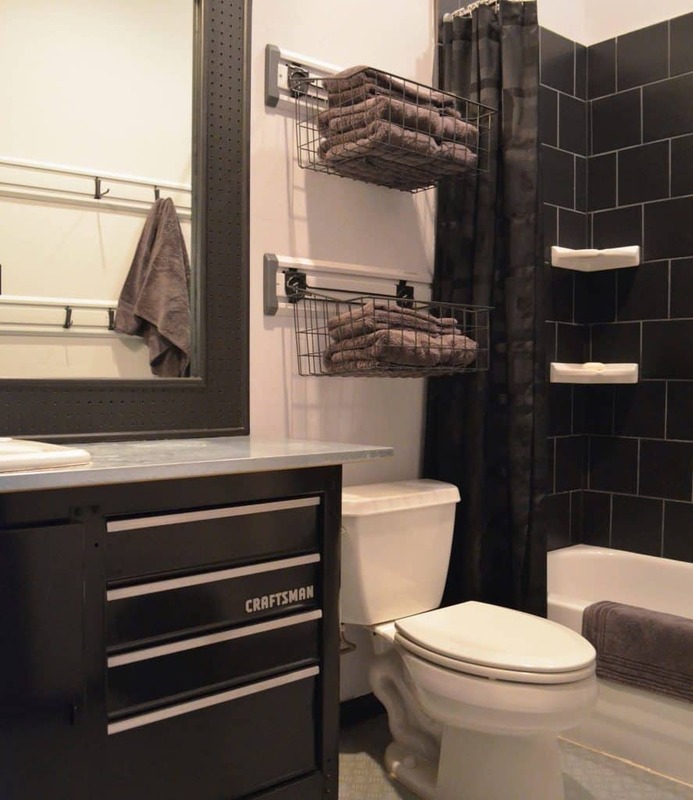 The good news is you don’t have to raze your home to get your dream bathroom with storage galore. The even better news is that there’s one incredibly simple way to achieve this and be the superhero your bathroom deserves: shelves. That’s right. A shelf (or two) is exactly what the doctor ordered. 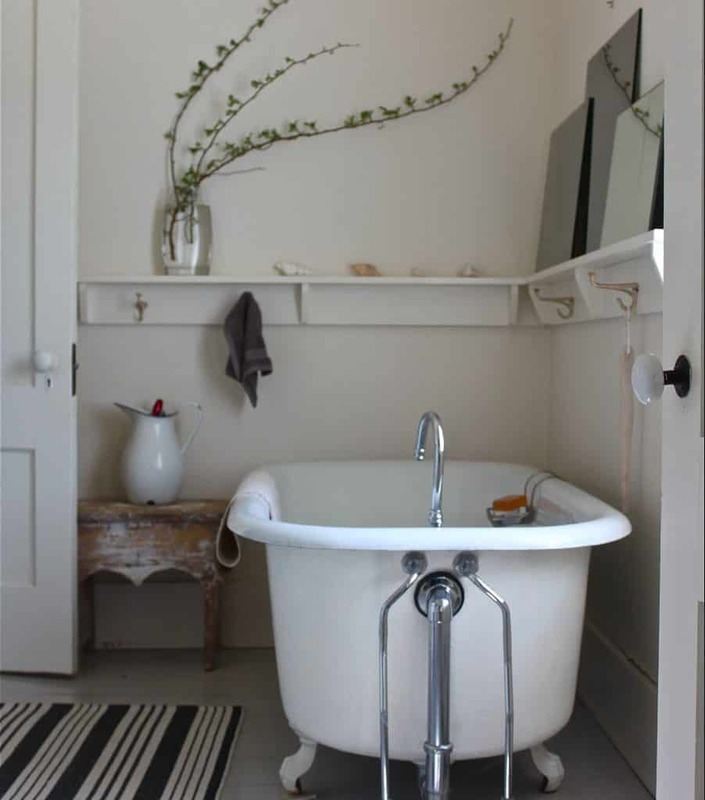 With the right bathroom shelves in the right place(s), your bathroom becomes an oasis. 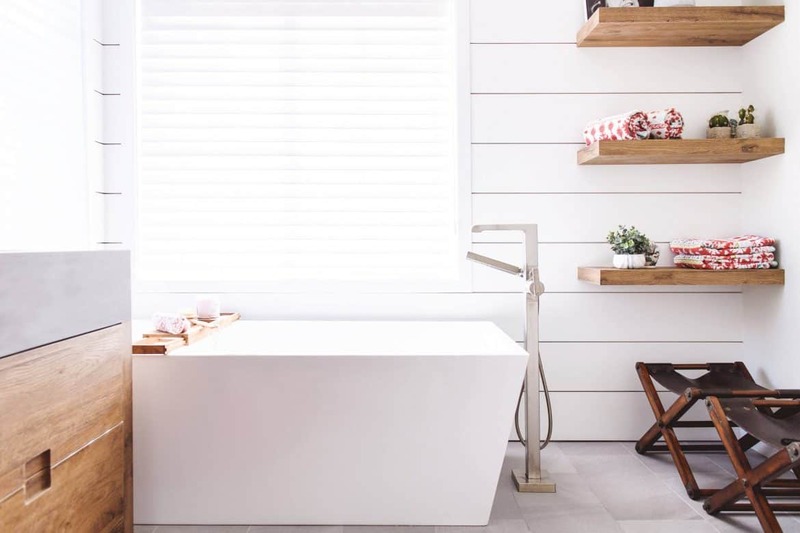 Whether you want practicality, aesthetic sensibility, or whimsy, there is bathroom shelving made just for you. 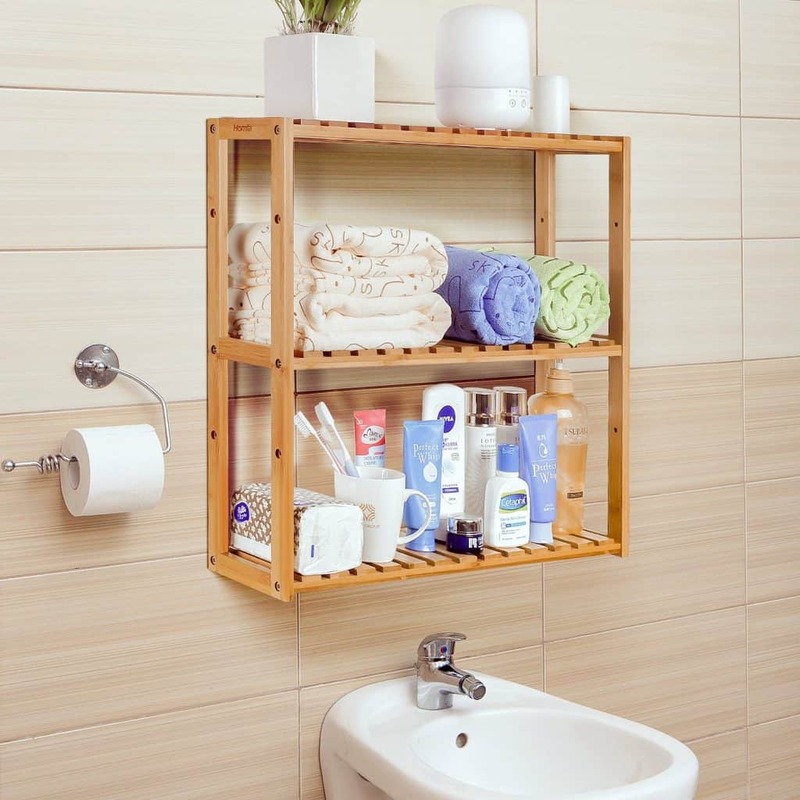 That said, here are some bathroom shelving ideas that will work wonders in your bathroom. Stay tuned all the way through to the end, and I guarantee one of these bathroom shelf ideas will work perfectly. 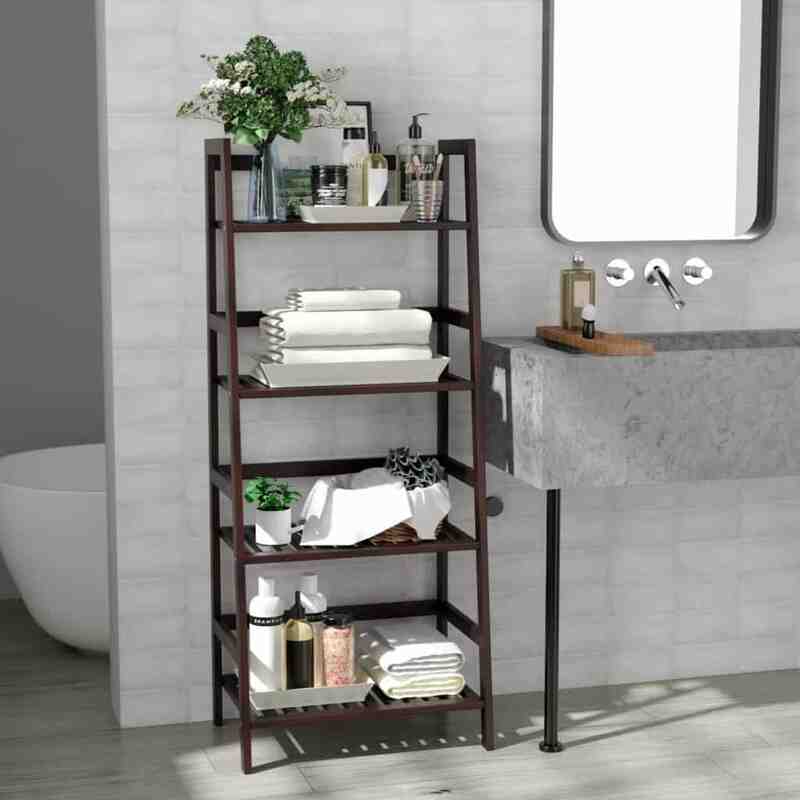 Gift yourself this multifaceted, multilevel shelving unit, then decorate it with plants and trinkets, as well as using it to store towels and sundries. Give this a try as you move through bathroom shelf ideas. Bathroom organizing has never been so fun. If you’re not the type to want to do any major (or minor) construction, I highly recommend a simple DIY ladder shelf over your toilet. It supplies direct and easily reachable storage and even decorative design space in a place that often goes under-appreciated. Sometimes, you need mobility. A small set of shelves gives you exactly that. These are perfect for flexing over near to the tub for your next bath. 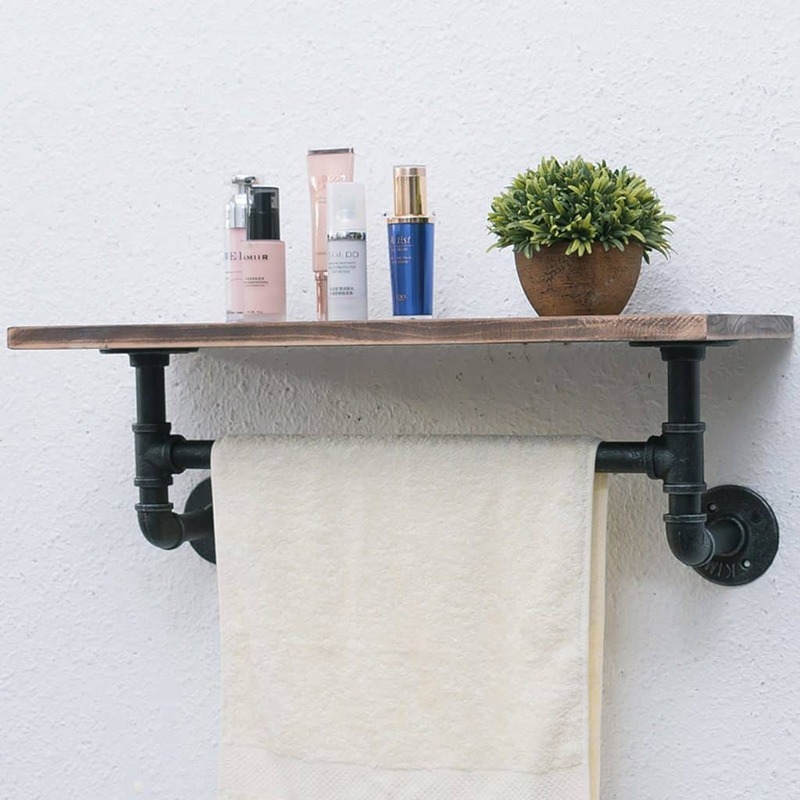 Combine the best parts of two worlds — industrial and rustic — with this accent shelf doubling as a towel rack. 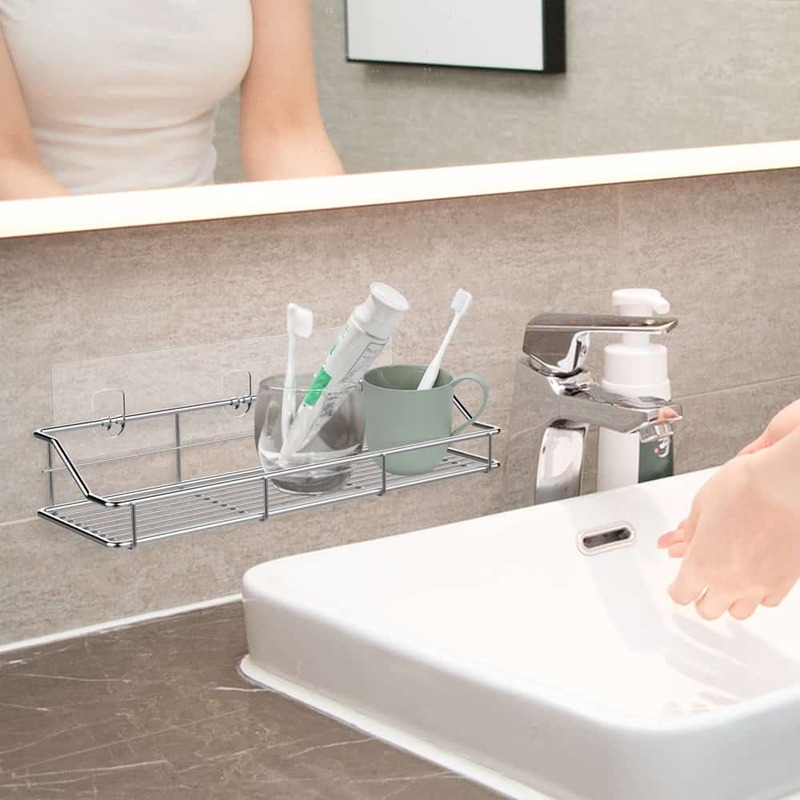 Combining any two ideas, bathroom shelf design can do pretty much anything you want it to. 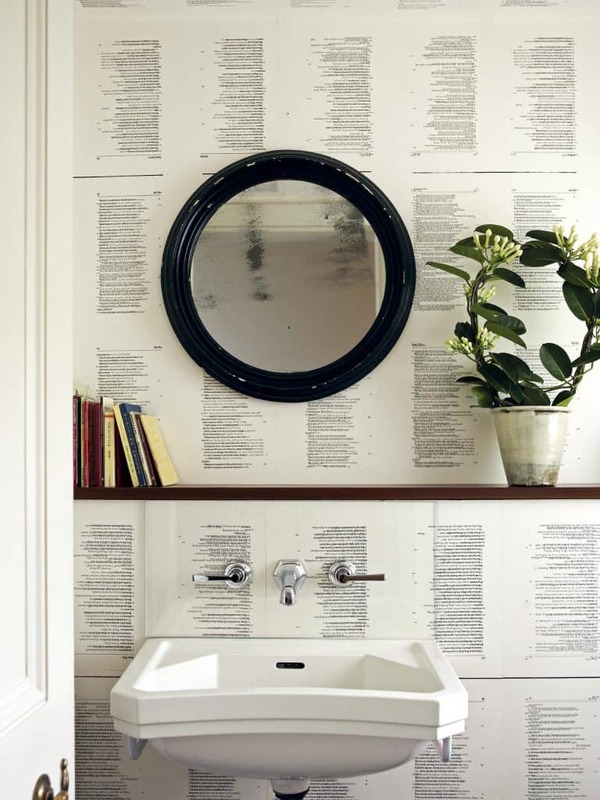 This shelf isn’t just for storing bathroom reading materials. Rest this against your wall and rest your towels on its tiered shelves for convenience and sensibility. 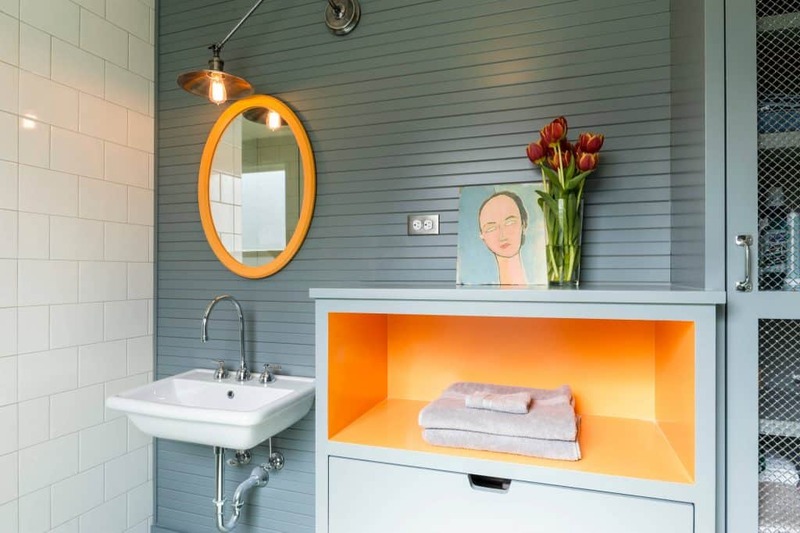 For those bathrooms that can’t have toiletries hanging off the wall into the open space, there is a fantastic solution: recessed shelving. Like recessed lights, these are tucked away, unassuming, and incredibly useful. 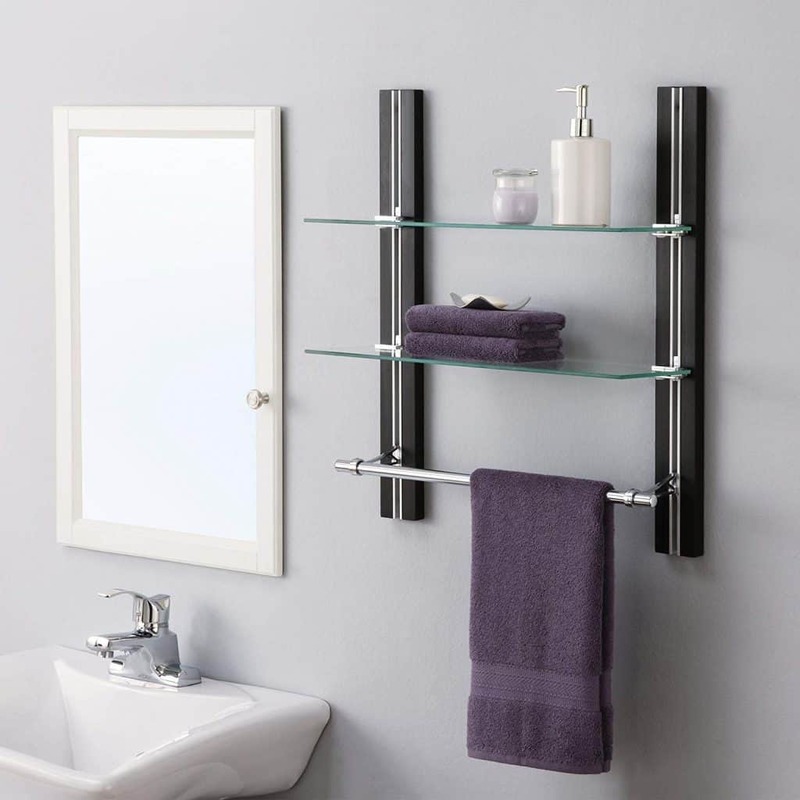 With these in your bathrooms, shelves bring the whole space to life. Wooden block shelves are clean, modern, and provide you the ability to put a shelf or series of shelves wherever is most convenient. 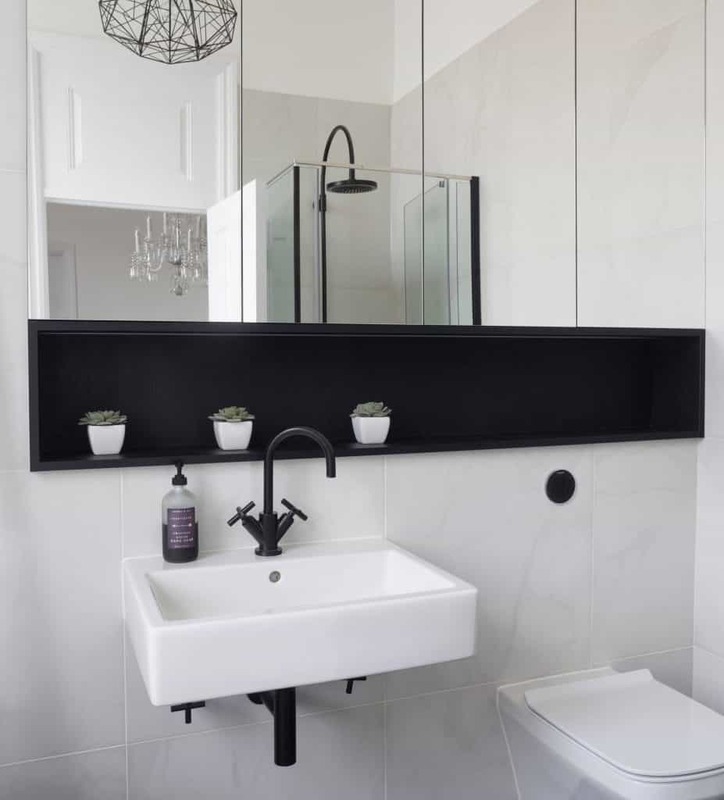 Similar to the wooden block shelving look, the single long shelf furnishes a similar aesthetic, while also extending the feel of your bathroom space. Depending on the depth, you might opt for a more functional or design-centric look. This is one of my faves. 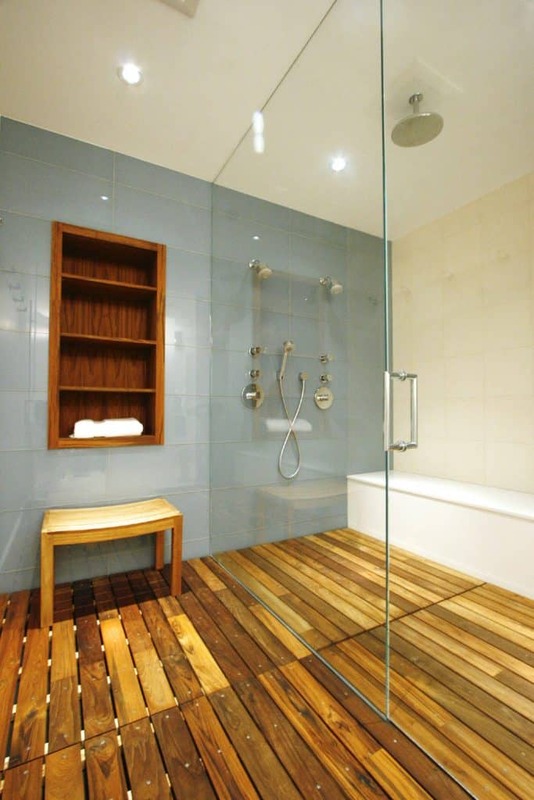 Reclaimed wood’s the trifecta: high design-oriented, functional if large enough, and environmentally friendly. If that’s not enough to get you excited, I don’t know what is! In all seriousness, if you can get your hands on this, I highly recommend it. 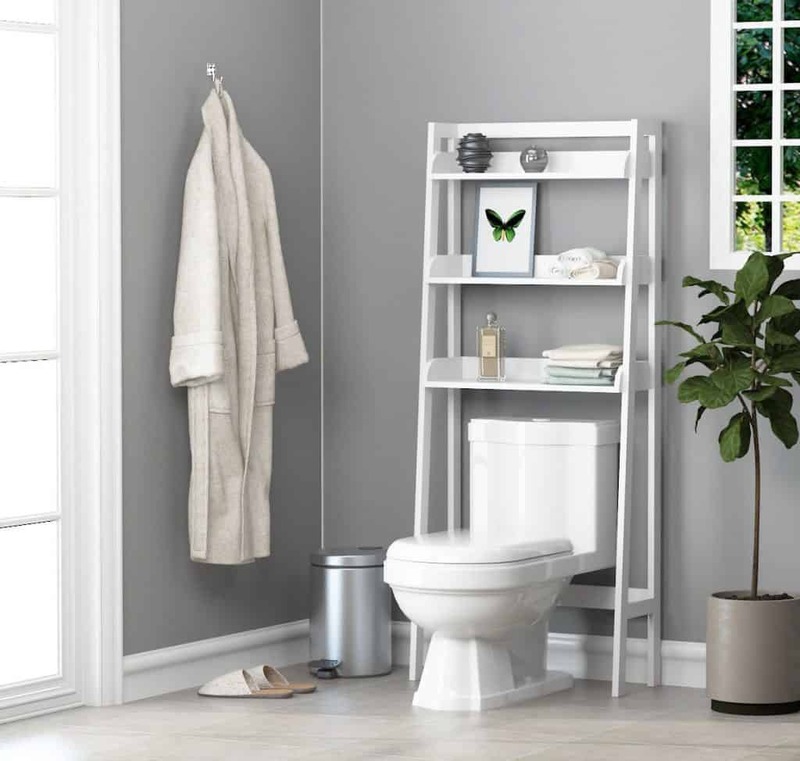 Just like the toilet ladder, the toilet cabinet functions in nearly identically, except that it offers some concealment for those extra TP rolls. Occasionally, rooms or closets have a small crawl cabinet. If you place a wooden block shelf directly over it, the space has an intentional, built-in look without architectural headaches. Can be used for hand soap near the sink, toilet paper near the toilet, and decorative elements anywhere. The beauty of these little guys is that they provide high design with minimal space requirements. 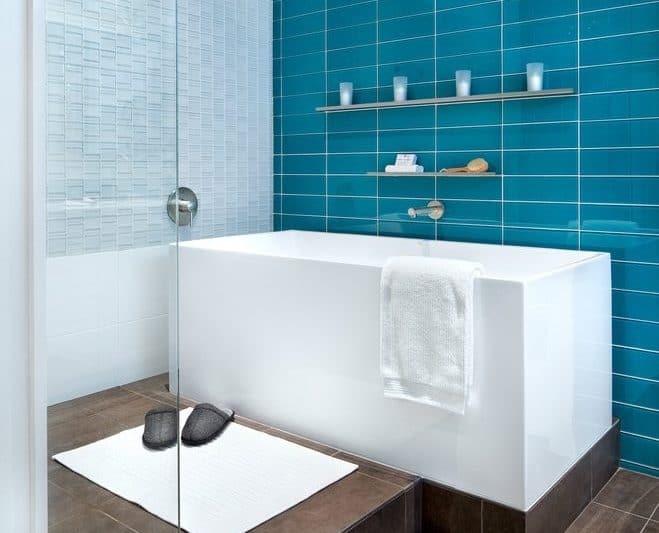 They work best as an accent to a tile wall, especially when incorporated with tea lights or well-designed tub utensils. 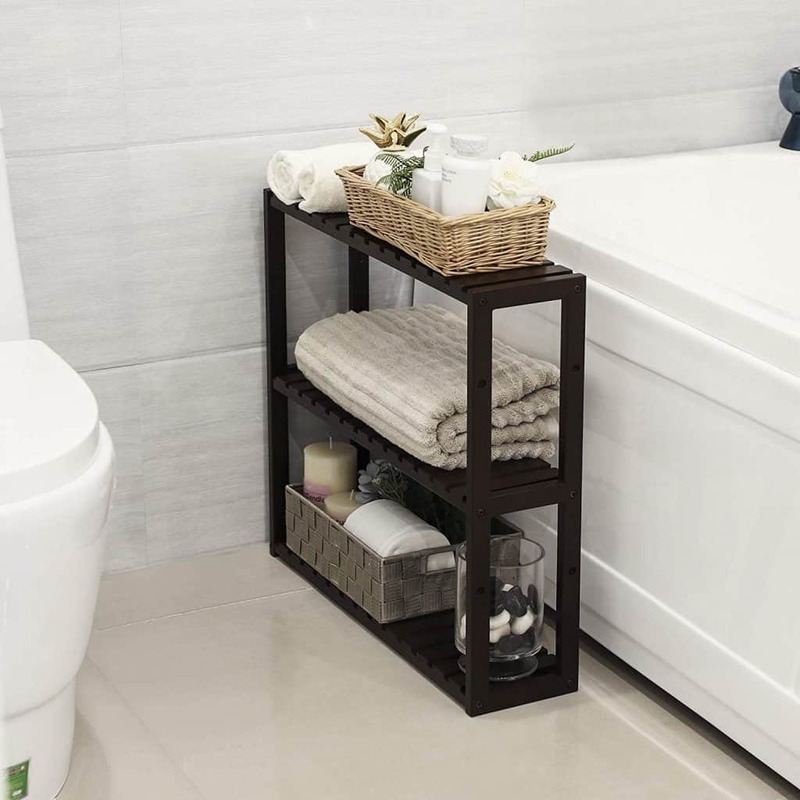 For those of you with bathroom space to spare, shop for a large side table that can double as a shelving nook. The three sections allow for distinct uses: decorate the roof, store folded towels in the middle, and drop other sundries down below. 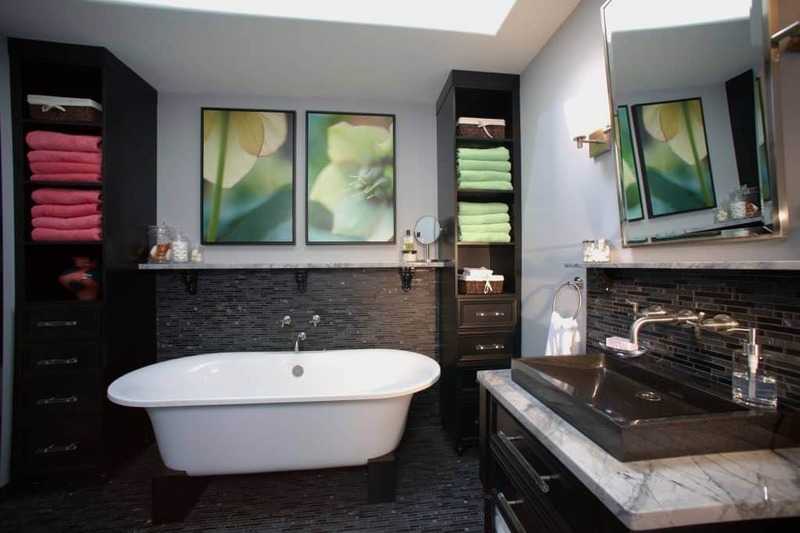 Wide bathrooms have a luxury element to them. Add to that (and take advantage of it) by installing a long shelf directly beneath the double vanity. It’s a beautiful take on a simple concept and can be done with a single piece of wood. Tiny rooms offer unique opportunities to improvise and work with what you’ve already got. 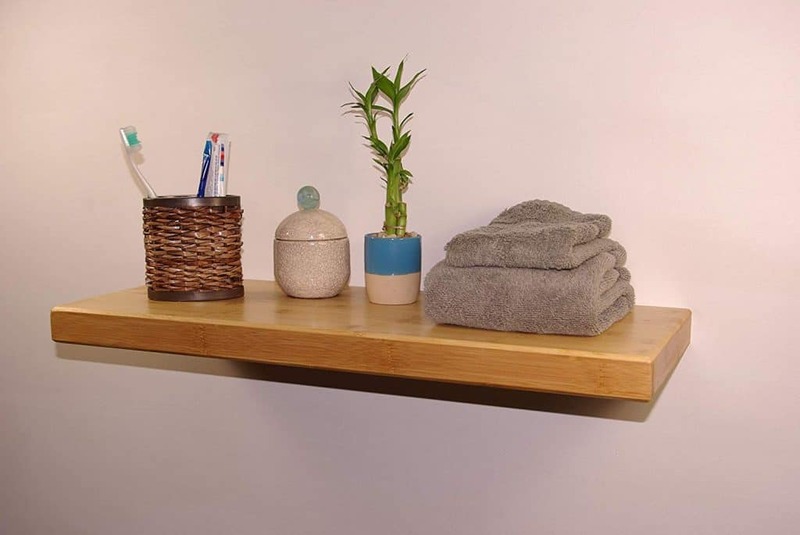 If your area is small, such as a studio apartment, the break in the wall provides an easy space to install a small decorative shelf without compromising the space that you have. Another perfect setup for you to move around your shelves, bathroom on wheels not required, and use them for a variety of different purposes. What I love about these is that they are open and closed. Your items are secured by a wire rod and bookends, and there’s a convenient towel rack as well. I see you, industrial chic. You want rugged and polished at the same time. 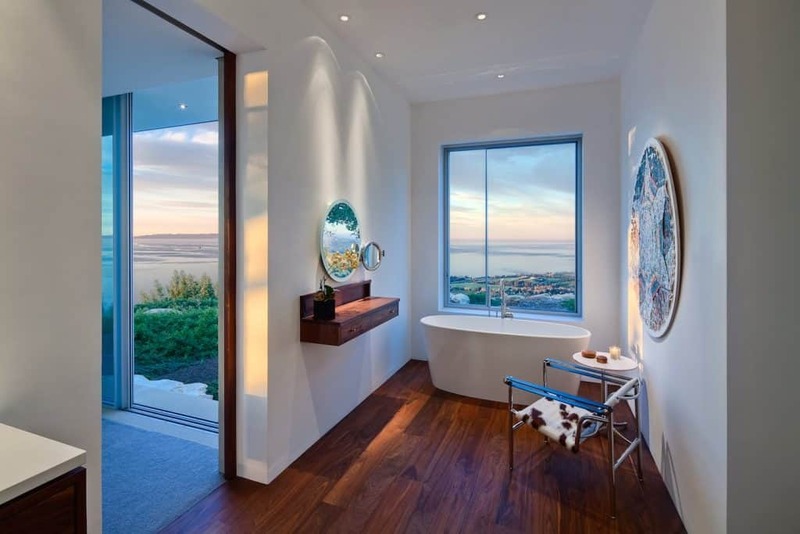 The wooden block here is classy, modern, and clean, while the towel piping infuses it with a bit of old-timey charm. 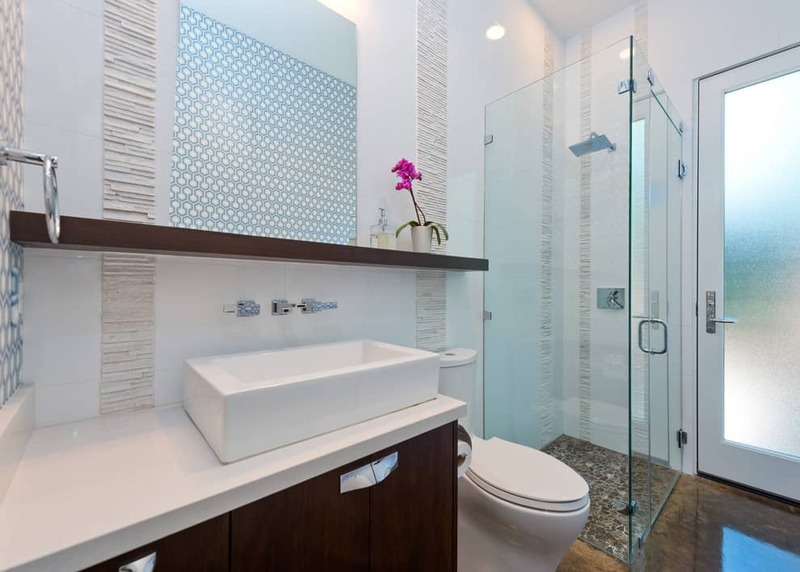 The benefit of getting to design your bathroom from scratch is that you can take advantage of every inch. Built-in shelves are a great way to do exactly this. They fit seamlessly into the bathroom area because they don’t jut out and take up any extra space. 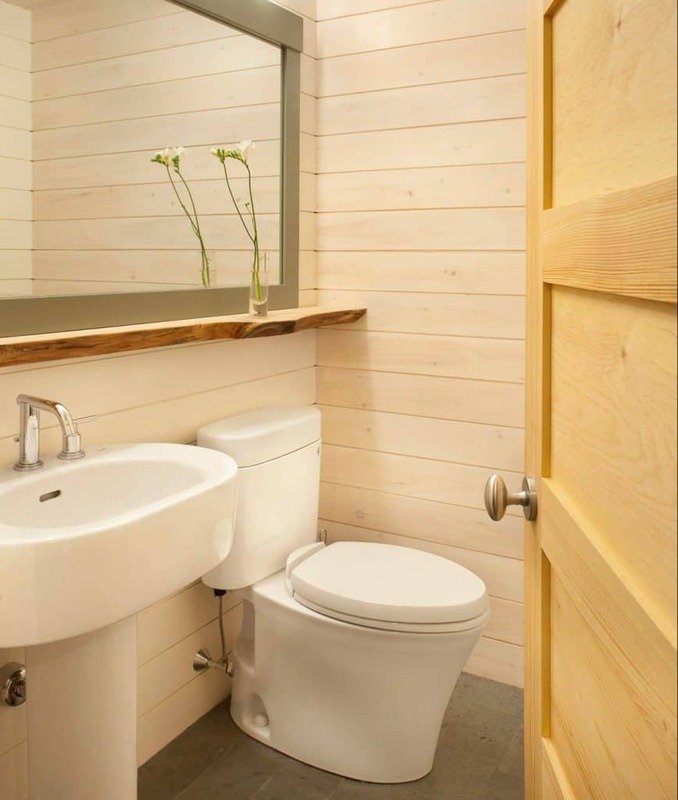 Some bathrooms lack a medicine cabinet (or just have an ugly one). Use this wooden replacement instead. 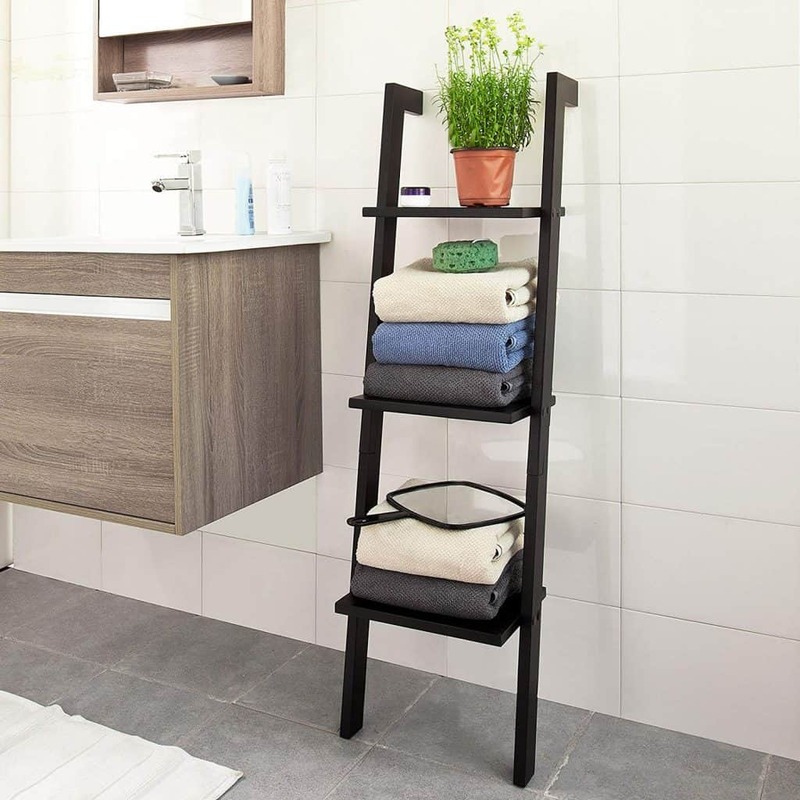 Wire racks are as sensible an option for a bathroom’s shelving as they come. There’s no mystery with these guys. They’re lightweight, transparent, and get the job done. 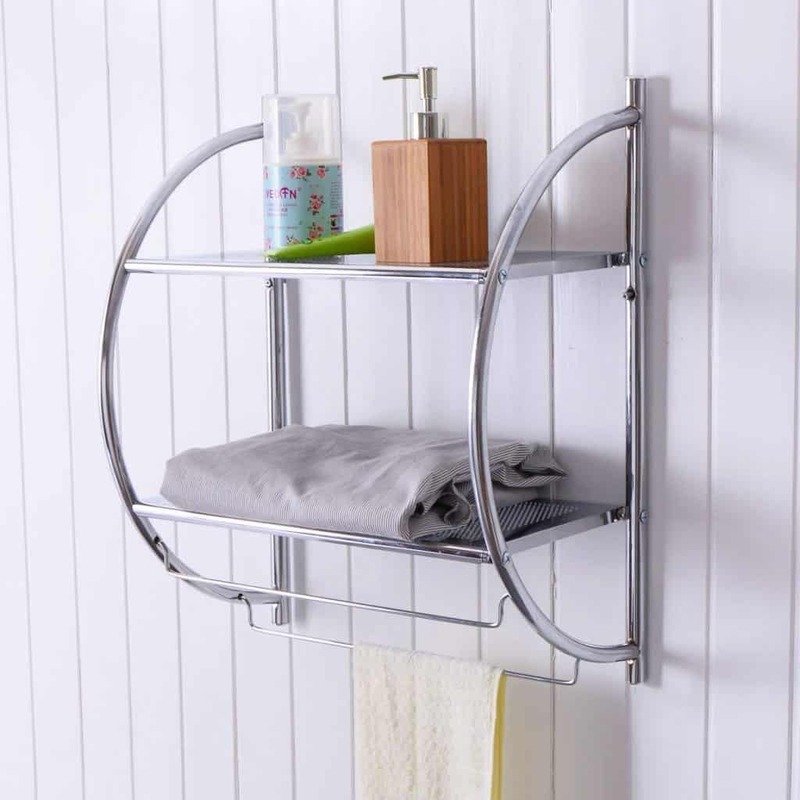 They are a great bathroom shelf ideas for storing towels. 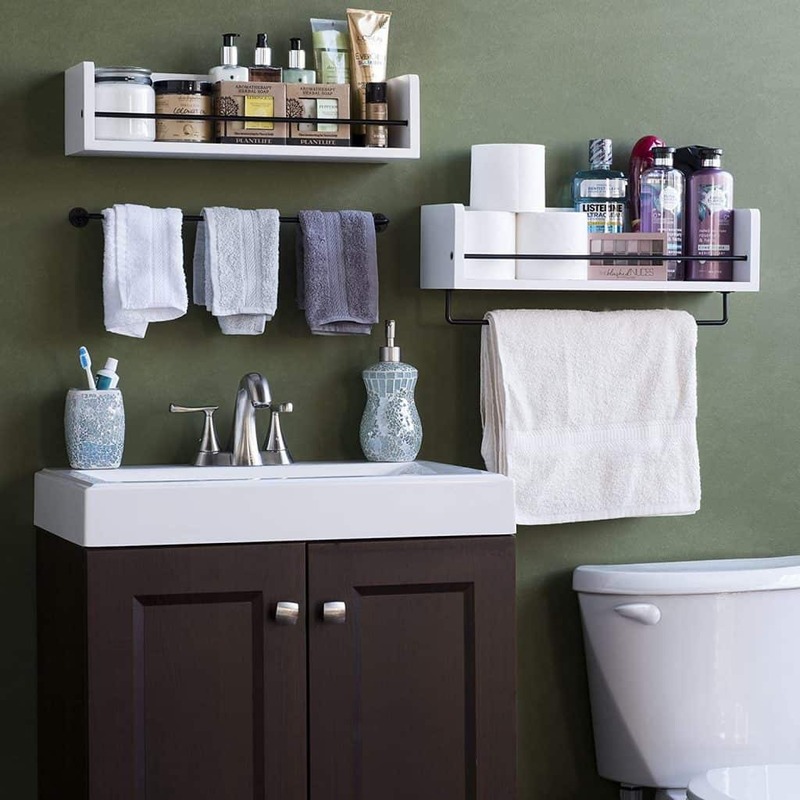 Another small space alternative to a “shelf bathroom” is a wire caddy. You can hang these just about anywhere (including the shower), but right next to your medicine cabinet is a great place to keep your most used toiletries. 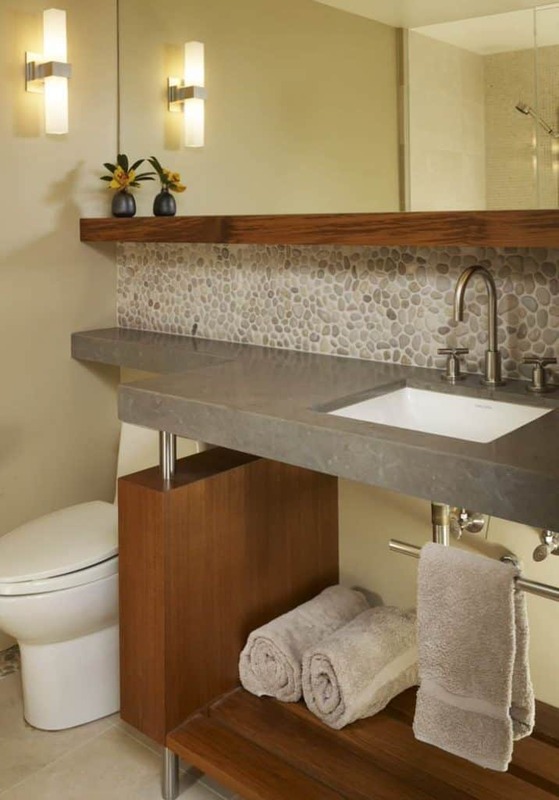 Similar to the under-sink shelf, over-sinks maintain separation of space in the bathroom, which is especially useful if yours doesn’t have a tile backsplash or crown molding to do that work for you. I also recommend a potted plant. The curved design of some wire racks gives them a softer feel. 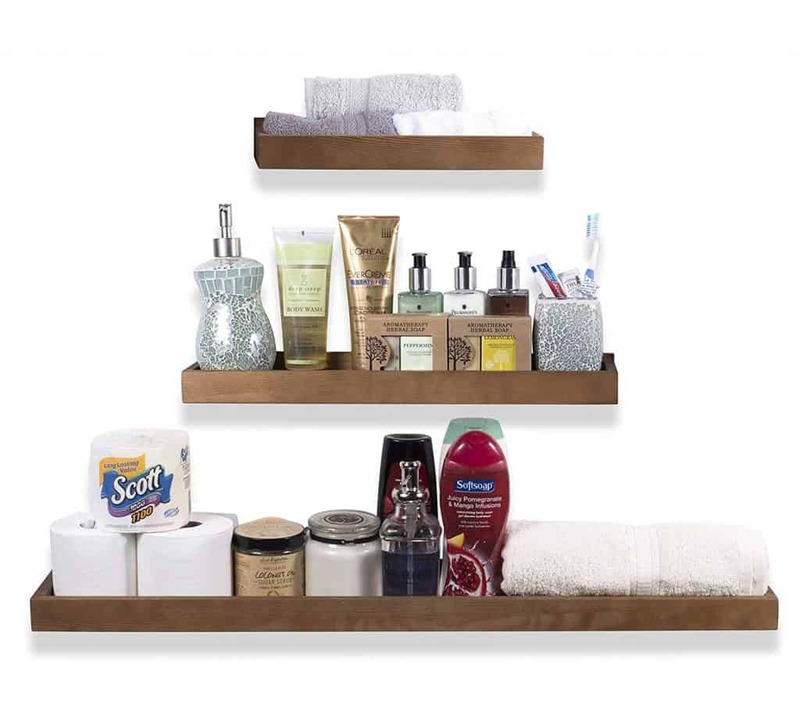 These bathroom shelf ideas furnish you with both shelf space and towel convenience. Take that space most people store TP and cleaning supplies and turn it into a modern, multifaceted masterpiece. A combination of wood and metal piping can be the perfect fit for a space high on design and low on clutter. I know what you’re thinking. Another block shelf? Nope! Well, yes. But this one is made of bamboo making it a sustainable replacement for traditional wood. 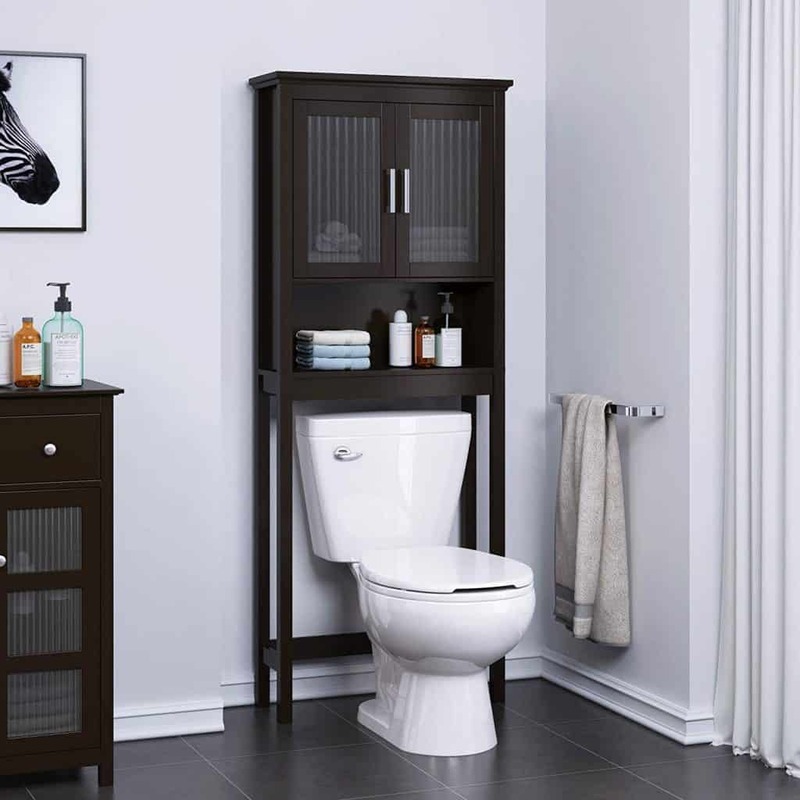 If you have ample wall space but not nearly enough shelving in your bathroom, this unit has your name written all over its beautiful, dark, wooden finish. You can make them even more functional with baskets of storage, as in this photo. There is something quite beautiful about a side table in the bathroom. Remove the legs and undercarriage and you’ve got something even more unique. This shelf variety furnishes your space with a charming, intentional feel. Hang a mirror overhead to complement. Stack a few of these shelves of different lengths to create a sense of intentionality, design, and functionality with minimal effort. Give yourself an aesthetic, rustic shelf. 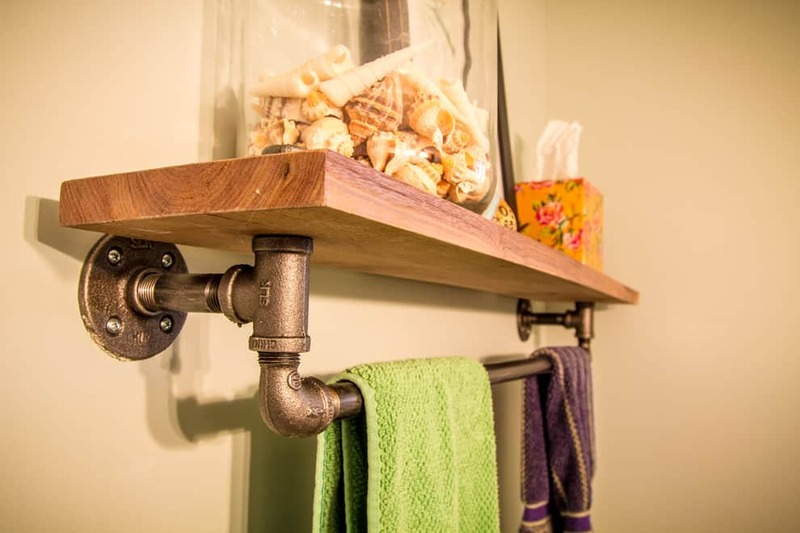 High craftsmanship and copper distinguish these shelves ideas from others, and they will do the same for your bathroom. Make use of those often overlooked corners and set up some inlaid tiered shelves. 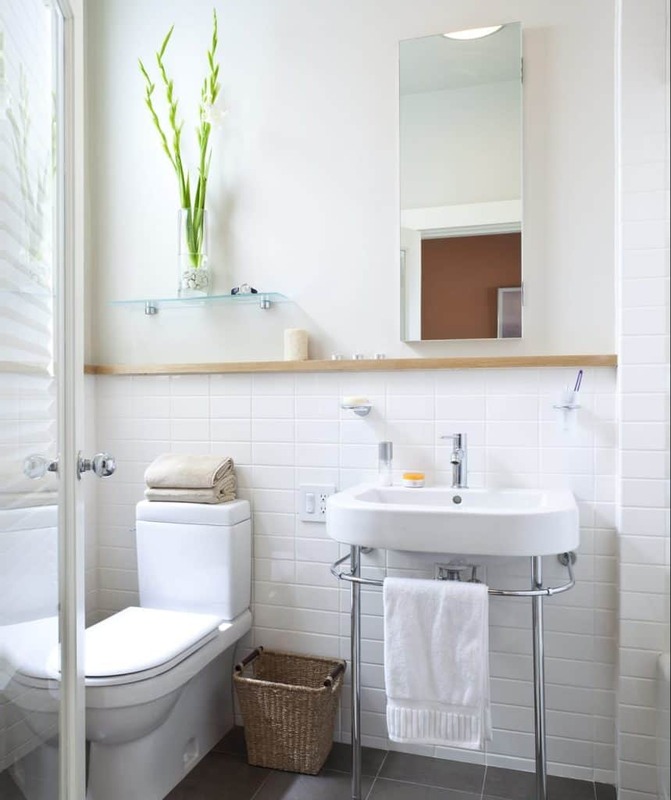 The look is clean and provides ample space to stack fresh towels. 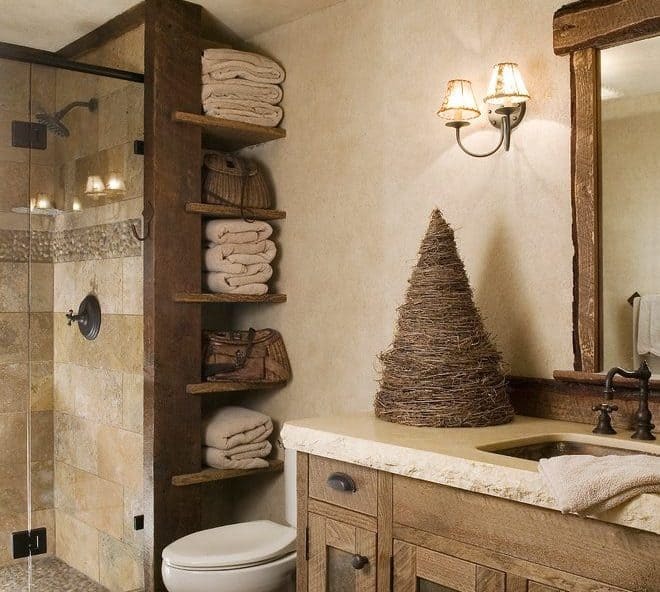 Throw in some woven baskets to complete the rustic look, and you’re well on your way to a bathroom getaway in the mountains. 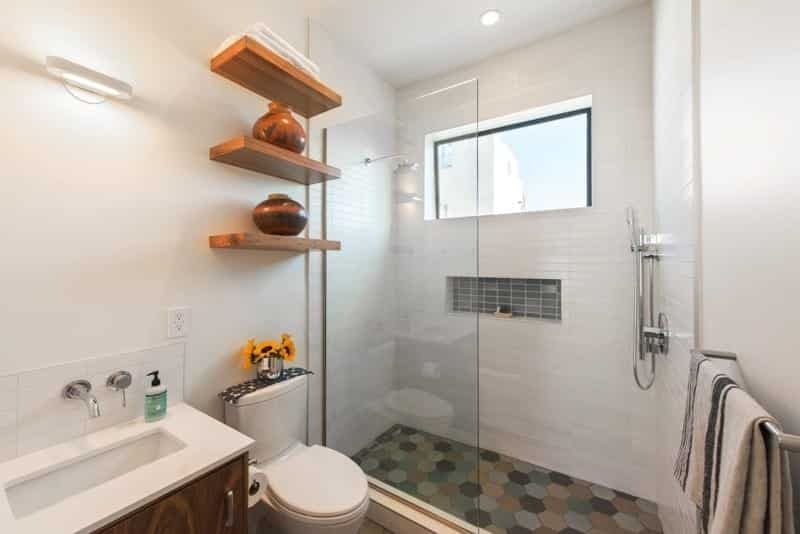 For the ultimate in design and practicality, go with a single long shelf that can hold towels for convenience alongside decorative elements. Add in a tall wooden locker, and you’ve got plenty of space for anything you want to keep hidden, too. 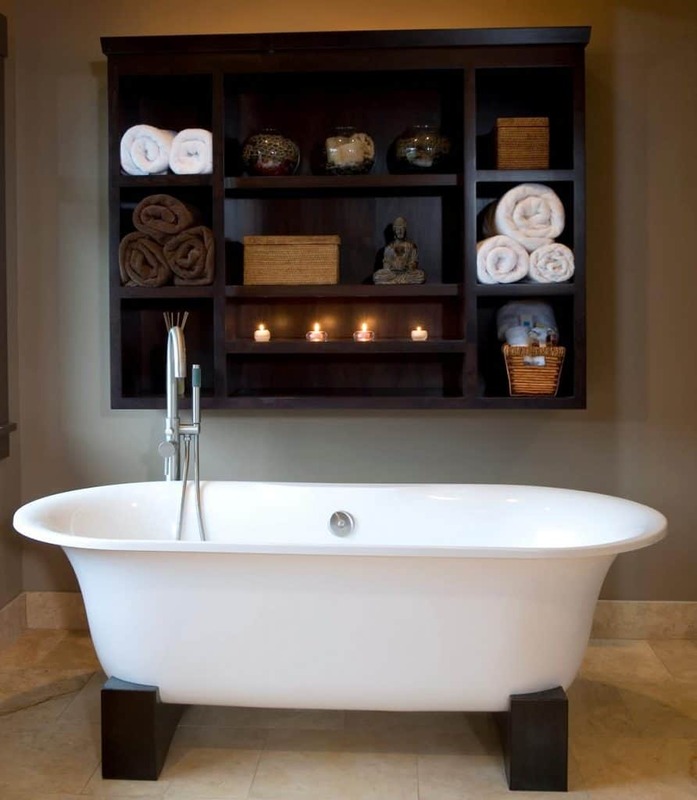 If you like the idea of having a day at the spa in your own home, give this wooden locker style shelving a look. Depending on your space and needs, you can have as many as necessary, though one or two is probably enough. 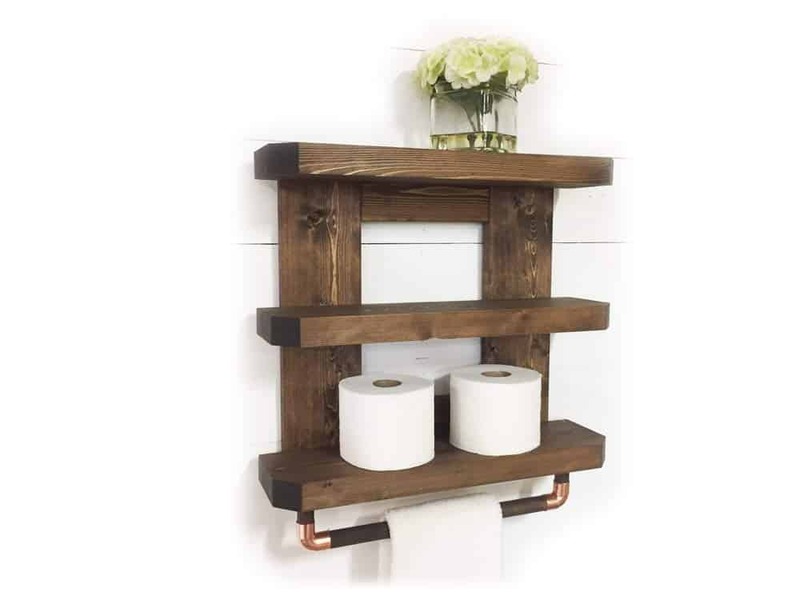 This first bathroom shelf idea is simple, understated. Because of its unassuming nature, the shelving can be adorned to feel either modern or rustic. The hooks add a layer of practicality for hanging towels, clothes, loofas, or anything else you need to keep nearby. 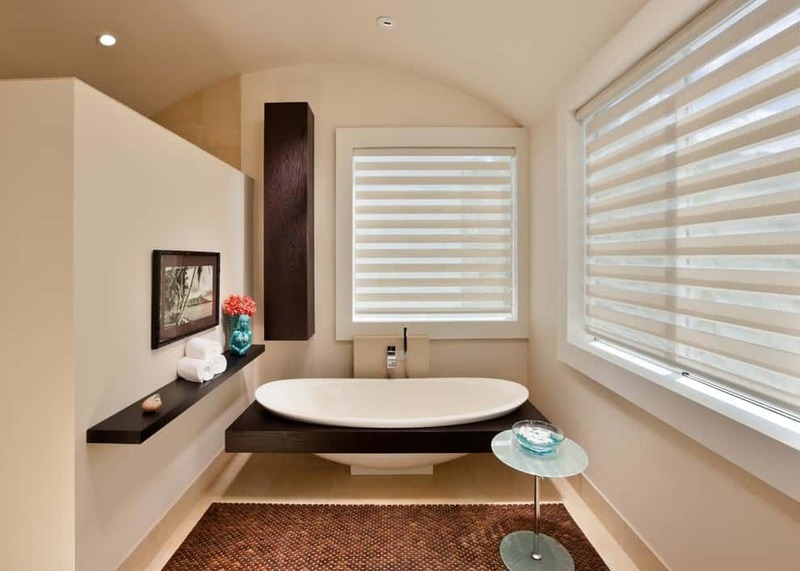 Store small bathroom necessities on the glass and hang your towels to dry. Its wooden finish complements the clear shelves perfectly.